Jul. 17: Our article "Weakened flow, persistent circulation and prolonged weather extremes in boreal summer" is published as a chapter in the AGU Geophysical Monagraph: Climate Extremes: Patterns and Mechanisms. It provides a great overview of of recent studies done in the atmosphere dynamics group at PIK. May 17: I participate in the General Assembly of the European Geosciences Union 17 - EGU and present our newest findings on wave 7 phase locking, the role of earths orographic profile and the changing Arctic. Our contribution "Influence of changing suface temperature gradients on mid-latitudinal circulation and western hemispheric summer temperature extremes" is selected as a session highlight. Apr. 17: Our article on "Summertime Planetary Wave-Resonance in the Northern and Southern Hemisphere" extends the resonance mechanism to the Southern Hemisphere and identifies regions at risk is published in Journal of Climate. Mar. 17: Our article on "Influence of Anthropogenic Climate Change on Planetary Wave Resonance and Extreme Weather Events" is published in Scientific Reports receiving some news coverage e.g. in The Guardian, The Independent and The Washington Post. Nov. 16: Allowed to participate as an observer in the COP22 in Marrakech. Read my blog-posts in Klimalouge (german) and ClimateExchange (english). Nov. 16: Our Article "Evidence for wave resonance as a key mechanism for generating high-amplitude quasi-stationary waves in boreal summer" is published in Climate Dynamics. boreal spring-to-autumn extreme events" explaining the US Heatwave 2012 and European flood 2013i s published in PNAS. Apr. 16: Together with the ClimateMedia Factory we produced this short clip on "Rossby Waves and Weather Extremes". Apr. 16: Participating in this years Anthropocene Campus at HKW - Berlin to discuss the challenges of the “age of humankind" with artists and scientists from various fields. Mar. 16: As a vistiting scientist I was allowed to stay for a month ECI - Oxford and CEH - Wallingford to work on a joint research project. Jan. 16: I was invited to participate in a panel discussion on the topic "Climate Protection and Justice" during this years Öko - Filmtour at HNEE - Eberswalde . 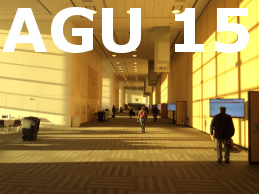 Dec. 15: Presenting our recent results on southern hemispheric planetary wave resonance at the Fall Meeting of the American Geophysical Union - AGU. 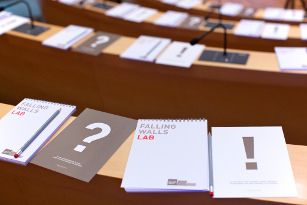 Nov. 15: At theExecutive Education workshop for Science based start ups organised by the Falling Walls Foundation. Nov. 15: Our research group is featured in the documentary "Klimaschutz und Gerechtigkeit" (engl. :"Climate Protection and Justice"). Watch it here on the RBB - homepage. Sep. 15: I was invited to give a talk on "Climate Change: Causes, Impacts, Perspectives" at the WWF - Students Workshop in Berlin. Mar - Jun. 15: Funded by a DAAD travel grant I'm spending three months at the School of Earth Sciences at the University of Melbourne and the Climate Energy College to work as a visiting scientist on southern hemispheric extreme weather events and large scale circulation patterns. Mar. 15: With fellow PhDs at PIK we organise the session on Climate and Energy at the PhD Conference on Earth System Science held at the MPIC in Mainz. Jan. - Feb. 15: Participating in the European Research Course on Atmospheres- ERCA at Université Grenoble Alpes and the Observatoire de Haute Provence in France. 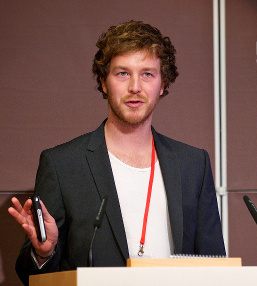 Nov. 14: Watch my three minutes talk on our recent findings I gave at this years Falling Walls Lab event. Oct. 14: At this years Extremwetter Kongress in Hamburg, Germany I gave a talk on the dynamics behind some recent extreme weather events in the Northern Hemisphere. Jul. 14: I'm allowed to participate in the Environmental Research Summit held by KIT in Garmisch-Partenkirchen, Germany. May 14: I participate in the General Assembly of the European Geosciences Union 14 -EGU and present some preliminary results on "Waveguide detection" based on the hypothesis by Petoukhov et. al 2013. Oct. 13: With a 3D-printable Jet-Stream we win in the Category "Most scientific Hack" during Berlins first Science Hack Day . Some Media Coverage here.